Winter Camp and Spring Camp – where kids really can have fun and continue learning! Winter Camp, held during the winter recess, and Spring Camp, held during Spring Break, provide high interest and engaging day camp activities for students in Trans K through 6th grade. The camps are open to students enrolled at Mt. Helix Academy and students from the community. Winter and Spring camps are designed for students to have fun, fun, fun!! 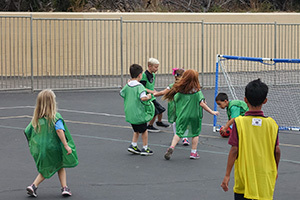 Students play indoor and outdoor games, including soccer, foam bowling, checkers, charades, four square, and much more. Computer fun, coding and robotics, cooking, and arts and crafts are also available. On the last day of each camp session, students participate in a special party and activities.